“Prime Minister Stephen Harper must explain why “draconian” anti-terrorism measures that were scrapped in 2007 are once again necessary, opposition MPs said Wednesday. “The prime minister has to explain to us why, if these measures are so important and so necessary, they were not in place for four years. Is the prime minister saying that for the last four, five years, we’ve been at risk? At greater risk because the measures have not been in place? I think he has to answer that question,” interim Liberal leader Bob Rae said. “THR: So what does work? Lawrence: There are some shows like Modern Family or American Idol where lightening strikes. Otherwise, you have two options. First, you build word-of-mouth. 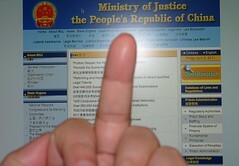 Protest pictures, details and comments posted onto the worldwide 1001 Chairs for Ai Weiwei Facebook group. Pix from New York City here, here, here. Pix from Munich here. This Sunday, at Chinese embassies all over the world, protesters are planning a global sit-in to protest the detention of the internationally renowned Chinese artist Ai Weiwei. Ai was taken into custody by Chinese authorities nearly two weeks ago for what government officials now say are questions about his finances. “Demonstrators all over the world were sitting outside Chinese embassies on Sunday demanding the release of the detained Chinese artist Ai Weiwei. Hundreds of protestors brought chairs onto the street tocall for the immediate release of Ai, and in support of the rights of all Chinese artists. You have spent a lot of time with Ai Weiwei over the last couple of years, during which time he has been increasingly publicly critical of the Chinese regime. Could you describe the issues about which he has been most vocal? Release Ai Weiwe 艾未未i ! 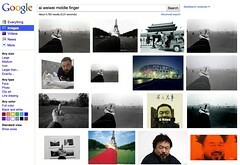 Where is Ai Weiwei? 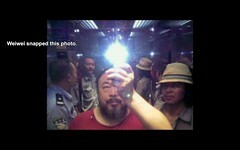 The lawless Chinese government has detained Chinese artist Ai Weiwei but his family, friends, and supporters have no idea of his whereabout. 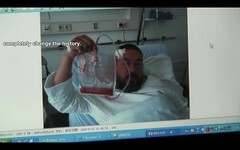 More news from: The Independent, Newsweek “A Provocateur Finds Out Just How Far He Can Go“. Here is a $1 billion Kodak moment. Kodak has already settled with Samsung and LG for a combined $964 million over the same patent. For the record, “Google Hits Another Speedbump on Way to Digitizing World“. If you are legally minded, you can read the judgement by US Federal Judge Denny Chin of the US District Court for the Southern District of New York.